When I got the invite to go back to the Pacific Northwest and climb Mt. Baker, I was ecstatic. 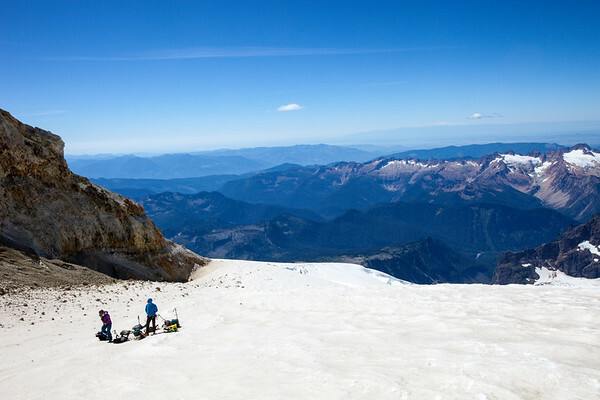 I’ve done a bit of mountaineering in the northern Cascades and have played on the slopes of Mt. Baker in the past but had never been to the top. The trip was with MSR to check out their spring 2017 product line including a number of new tents, cooking utensils, water filtration and stoves. It was the perfect setting. We were guided by Matt and Ryan of Backcountry Adventure Guides out of Seattle and met them the morning after we woke at the trailhead. The air was brisk but we knew the day would warm. Not to mention our effort of hauling our packs and climbing gear up the side of the mountain. The views were amazing, as they always are in the northern Cascades. Soon our trail crested the ridge of the medial moraine left behind by the glacier that once filled the deep U shaped valley that was now below us. A narrow stream of silver water glistened in the high sun below us. 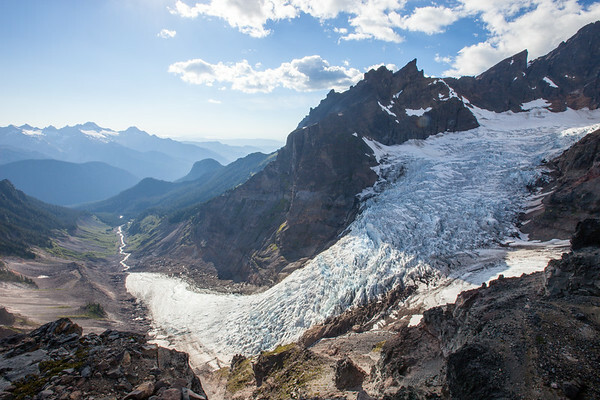 The water came out from under what was now left of the glacier as it continued to melt into the summer. Wandering up along the moraine we cleared timberline and soon found ourselves in the rocky talus of the exposed massif. Once on the snowfield ourselves, we found a beautiful rocky outcropping to establish camp. Tents were set up and clever arrangements of rocks served as our way to stake the tents down since it was very difficult to pound stakes into the solid earth. Once the sun went down the wind came ripping down the mountainside and my tent happened to be right in the brunt of the force. My tent mate and I held the tent in place from blowing away as we reinforced our rocky staked out guylines. Once securely tied down with help from a few others, the tenacity of the tent showed it’s true form. The Easton Syclone poles of the new Access tent bowed with the wind without snapping the poles. The wind blew into the night, despite my tent mate predicting that once it was dark the wind would die down. On occasion, the tent wall would push down onto our faces. The night did pass relatively quickly and I must have slept some. 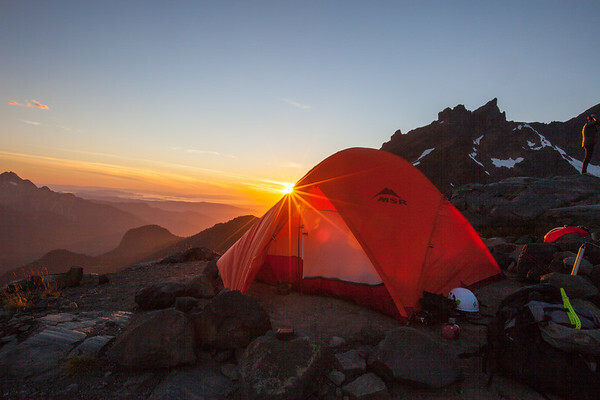 The morning was calm and everything was covered in the fine mountain dust that came through the bug-netting body of the tent, and possibly worked its way through the solid nylon weave as well. We weren’t in much of a rush, but had to keep moving to get our gear sorted, breakfast eaten and onto the climb. Everyone was double checking their tent tiedowns to be sure camp wouldn’t blow away while we were summiting. Spoiler alert: everything stayed put. The morning shadows were cool and once we reached the sun beams we could start to peel a few layers. 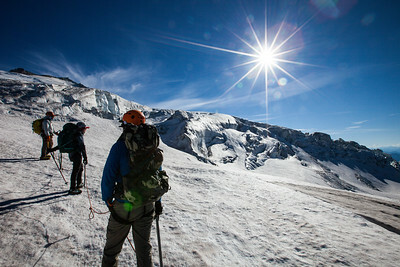 With spikes on our feet and in our hands, we worked our way up the sun-sculpted snow surface. The texture of the surface changed from smooth and rounded, to working our way around cravasses. Soon we were wandering on snow covered in the espoused sulphur from the crater of the very volcano we were climbing. At one break point, we reached the lower crater rim and could peer down into the crater where steam vents purged pressure from within the earth. From here we still had a 1000 vertical feet to gain to the summit. The sun was high in the sky but a slight breeze kept temperatures comfortable for climbing. The slope got steep and we switched back and forth around more cravasses, some hundreds of feet deep with wide gaping gashes in the surface of the glacier. Slowly, the steep slope started to round over towards the summit plateau on the upper reaches of the crater rim. Once the ground leveled out below us, it was just a few hundred yards across the snow to the true summit—a snowless, 30-foot, bump on the rim of the crater. The weather at the summit was incredible. After hanging out on the true summit for 20 minutes or so, we lounged out on the snowy plateau nibbling on snacks, melting and drinking water watching the sun wander across the sky. Finally we rallied and motivated ourselves to start walking down. Since we’re camping again, we weren’t in a rush to push out to the trailhead that night. Plenty of time. The climb down was uneventful, except now we got the view of the valleys and peaks beyond Mt. Baker in our view instead of just looking at the slope before us as we had done on the way up. Finally, those familiar orange tents appeared and we made our way back down and settled into relaxing and making dinner. Three days is certainly a luxurious way to climb Mt. Baker, especially from the south side as we did. Some do it in just a day making for a huge push. But if you have the time, enjoy the view. This entry is filed under: Climb, Earth, North America, Photography, Story.